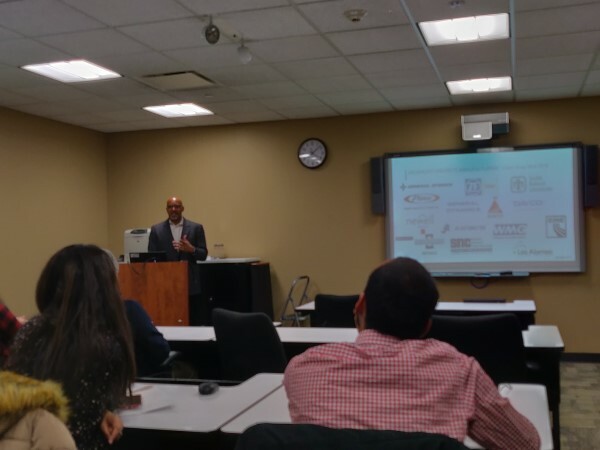 Lewis Kennebrew, Senior Director of Business Process Consulting at ArcherGrey, gave a presentation to Lewis University Computer Science and Computer Engineering students on Wednesday, February 6, 2019. He described what ArcherGrey does, the kinds of people who work there and the roles they play, and how students can best prepare for a rewarding job as a technical computing consultant. ArcherGrey, a boutique consulting firm, specializes in providing Product Lifecycle Management (PLM) solutions to a variety of manufacturing companies, from makers of large-scale industrial equipment to government agencies to fashion apparel and footware designers and manufacturers. The company employs thirty-five consultants who serve a large portfolio of Fortune 500 and Fortune 1000 companies and government agencies, helping them better manage their manufacturing and business processes. At the heart of what ArcherGrey provides its customers is PLM software. PLM software helps companies organize its operating and production processes in exacting detail, giving them unprecedented visibility into the intricacies, dependencies, efficiencies, and bottlenecks of the systems they use to make their products and provide their services. ArcherGrey’s technical consultants specialize in integrating PLM into companies’ existing infrastructure. This often involves writing custom Java code that bridges the gap between a company’s existing systems and the PLM tools, or figuring out how to integrate PLM with popular Enterprise Resource Planning (ERP) and Customer Relationship Management (CRM) software. Lately, ArcherGrey has gotten involved in projects involving Internet of Things (IoT) integration. This requires skills not only in programming, but in computer networking and cybersecurity, as well. ArcherGrey’s employees play a variety of roles. Some are technical consultants, writing software and designing and testing integrations, usually using Java. Others are process consultants, who don’t code very much but who do solve problems aimed at streamlining processes and making them more resilient. Other employees work as system administrators, project managers, and sales representatives. Though their employees work from areas all around the country, they stay in contact with each other through video conferencing and messaging tools, and they never hesitate to borrow from each other’s expertise as a particular project might require. Lewis lauded the benefits of working as a technical consultant. Whereas many people might work for one company over an extended period of time, it is very common for such people to do the same set of tasks over and over. This constrains their range of experiences rather narrowly. Consultants, on the other hand, get to work for a great number of companies on numerous projects, each of which offer fresh challenges and teach new lessons. Consultants get to meet a lot of different people and work with myriad technologies as they seek to do right by their customers. ArcherGrey hires people who act professionally, have strong interpersonal skills, possess robust technical skills and knowledge, are adept at solving problems, are mentally agile, make decisions quickly and well, and have the potential to lead others. Clearly, ArcherGrey values soft skills as much as if not more than technical know-how. In fact, Lewis claimed that, in any given career, you end up using only 10 to 20% of what you learned in your major courses in school. The rest, you learn on the job, working with others on problems, picking up what you need as you go along. Mentally agile people who learn quickly, work hard, and aren’t afraid to ask questions and discuss alternatives with their customers and their team, succeed. They do need that technical foundation, of course, the kind of content and context a rigorous program in Computer Science can give. But they need to supplement that with professional affability and strong communication skills to make a lasting and valuable contribution to the team. Students can position themselves for a career with ArcherGrey or a similar consulting firm by doing well in their courses. Lewis said that good grades suggest you have the necessary mental agility, because you can learn many different things quickly and demonstrate your command of the material. He also emphasized joining and leading clubs, because, through these experiences, one develops the necessary social skills. He also emphasized the need to practice writing and presenting. In fact, he said that the number one skill lacking in most new graduates isn’t technical acumen, but the ability to write clearly, concisely, and accurately, and then the ability to present the key aspects of the work without subjecting the audience to an eye test. The students and faculty who attend Lewis’s talk learned a lot about ArcherGrey, but also about the tremendous appeal and unique challenges of technical consulting. I think some left the talk with a new set of career options in mind.